I recently started reading the book The Hidden Life of Prayer by David McIntyre as a part of Tim Challies “Reading Classics Together”. You read one Chapter a week, make notes, think of application, and then add to the comments on Tim Challies blog (he posts about the book every Thursday). It is a great activity and a way to read great books together with a lot of people. There is often great insight in the comments. As I read along, I will be posting a few short thoughts on each chapter. 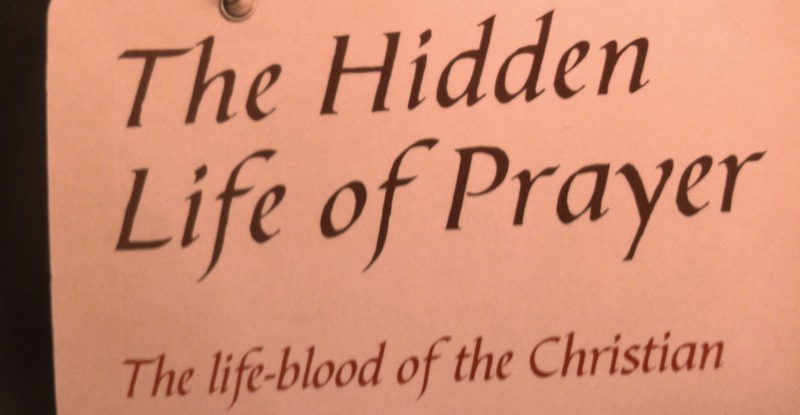 If you would like to begin reading through this book, here is a link to the book (http://www.amazon.com/Hidden-Life-Prayer-The-Life-blood/dp/1845505867/ref=sr_1_1?ie=UTF8&qid=1338576730&sr=8-1). Read through the book and visit challies.com on Thursdays to read along. In chapter one, McIntyre talks about the importance of cultivating a life of prayer. This seems to be more intimate and thorough than desiring simply to cultivate a time of prayer. I have always thought of the importance of having a dedicated time of prayer. For instance, it would be good to pray for 30 min to an hour or more in the morning. I’ve tried this many times and have failed miserably. Praying is difficult work. It takes focus and endurance. Satan, our adversary, does not want us to be people of prayer. I have oftentimes thought that he attacks our communication with God. He distracts in times of our Scripture reading (God communicating with us) and our prayer (us communicating with God). If Satan can keep God’s people cut off from God, then he has accomplished much. He has declared war on the children of God, and we desperately need to stay connected to our great General. I love the idea of not just developing an intentional time of prayer, but cultivating a life of prayer. Andrew Bonar (McIntyre’s colleague and predecessor) said, “I see that unless I keep up short prayer every day throughout the whole day, at intervals, I lose the spirit of prayer. I would never lose sight any hour of the Lamb in the midst of the throne, and if I have this sight I shall be able to pray” (Andrew A. Bonar, Diary, 7 October 1860). It is this kind of consistency and continuity that I desire. I also loved how McIntyre discusses the image of a praying life in the Old Testament as walking with God. Too often, I view prayer strictly as closing my door, getting on my knees, and lifting up other brothers and sisters. What is needed is to cultivate a life of prayer that abounds in ceaseless and uninterrupted connection. Next ›The Gospel is for Children, Too!